MANY FOODS, INCLUDING dairy products, meats, fish, some grains, sugars, alcohol, and caffeinated beverages can contribute to an overabundance of acid in the body. To combat the indigestion and discomfort these foods may cause, people take antacids. 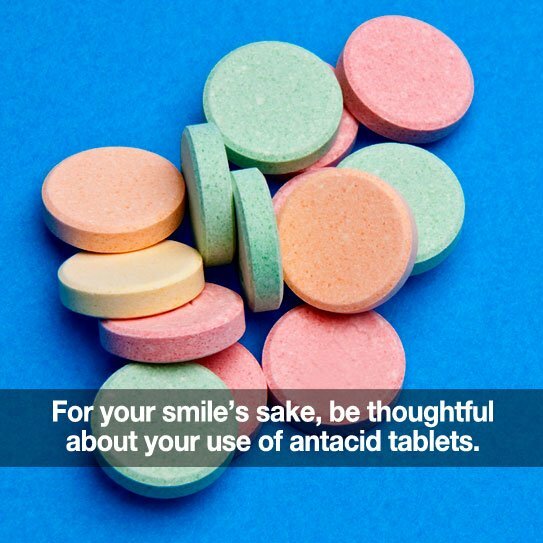 Trouble is, antacids can have damaging side effects on your smile. For proper digestion, your stomach needs a certain level of acidity. If you take antacids too often or in high enough doses, your body can react by producing more acid than normal. Too much acid can lead to more heartburn (and may compel you to take even more antacids). In their attempt to block the acid production, antacids can inhibit the absorption of calcium and protein—both vital components for improving the strength of your teeth and jaw. Antacids can cause dry mouth. With less saliva in your mouth to wash food debris from your teeth and neutralize the acid produced by plaque, you’re more likely to experience gum disease and tooth decay. Antacids are also often full of sugar and the chewable ones can get stuck in the crevices of your teeth. This type of prolonged exposure can contribute to cavities. Use antacids in moderation. Try sugar-free ones. Rinse your mouth after taking antacids, and after eating acidic foods. Consume less acidic foods and drinks. To protect enamel, wait about 30 minutes to brush after eating antacids or acidic foods. Sugarless gum and candies can help with dry mouth. Baking soda can help clean your teeth AND neutralize stomach acid. We hope this information was helpful. If you have questions about antacids, please ask us. Thanks for being one of our valued patients! Listening To And Learning From YOU!